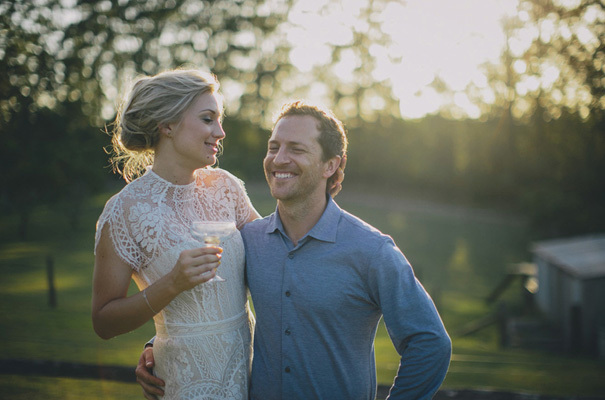 Prior to their wedding day, Lauren and Joshua watched their love grow. Their love for basil, that is. Josh’s sister Liz and partner Tim volunteered to grow 60 pots of basil from seed for their table settings that would later double as gifts for guests. £As well as making us a double loveseat swing to hang in the tree!, says Lauren. It was a lovely contribution to their day and not the only one  Lauren’s sister designed their wedding invitations, while Josh’s mum surprised them with beautiful vine heart decorations she’d made. When it did finally happen, it was a beauty, so thank goodness Stories by Ash was invited along to capture all of the action. 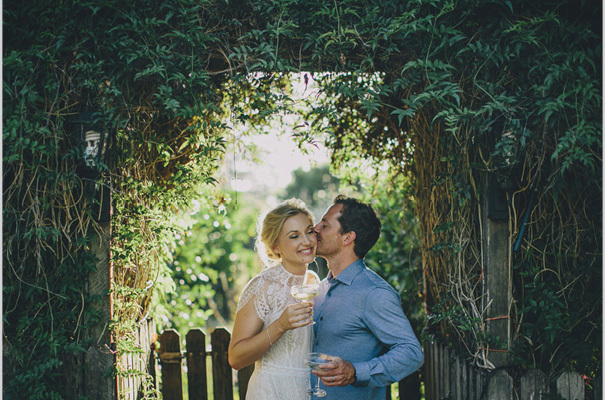 Held at the tranquil Mango Hill Farm in Peachester, Queensland, guests enjoyed the stunning surrounds of the Sunshine Coast hinterland while sipping champagne. Lauren, who rocked a lace Lover the Label gown and Hobes gold leather sneakers, says, £neither of us wanted a themed wedding, so our emphasis was on making sure people felt comfortable to relax and have a really good time. Seating was casual, with less chairs than people, which meant the whole night was a fun game of musical chairs and dancing wherever you stood. And as for what happens in part three? We might just have to wait and see. Lauren and Josh’s wedding was originally published in issue five of Hello May magazine, which you can purchase here with free postage! CREDITS Photos Stories by Ash // Bridal gown Lover the Label // Veil Tirra Lirra Atelier // Shoes NineWest and Hobes // Flowers Rebecca James Floristry Designs // Rings Katherine Bowman // Bridesmaids Alice McCall, Honey & Beau // Grooms shirt Prada // Pants Dr Denim Grooms shoes Hobes // Ceremony and reception Mango Hill Farm, Peachester QLD // Catering Dalton’s Catering // Stationery Amy Anderson // Hair AKA Togninis // Makeup KJ Artistry // Celebrant Robyn Ramsay.